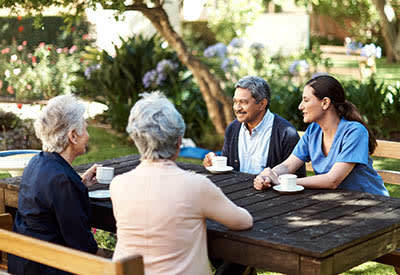 Memory Care: Our exclusive Meaningful Moments training enables our caring and highly-trained staff to learn of our memory care resident’s life before it centered on their dementia needs. By taking these stories and creating daily touch points of experiences and items from that time, our staff is able to create meaning for residents struggling with Alzheimer’s disease. Respite Care: For those seniors in need of rehabilitation after an injury or caregivers who need a break from the demands of caring for a loved one, the respite services of Maple Wood Alzheimer's Special Care Center are beyond compare. Our team of therapists and nurses will work with each guest to put together an individual plan of care and help the healing process begin. Our senior care services include all of the comforts that come along with a well-lived life at Maple Wood Alzheimer's Special Care Center, including sumptuous meals in our dining room, a whole host of entertainment options, transportation services and freedom from daily chores such as yard work and housecleaning. Visit Maple Wood Alzheimer's Special Care Center today or call and find out first-hand how our senior services can not only help, but enhance the life of your loved one.